Ah, Italy. A diverse land of rich history, enchanting landscapes, high fashion, and of course exquisite food. With such impeccable cuisine comes a tradition of high-quality ingredients and cookware, creating culinary magic. 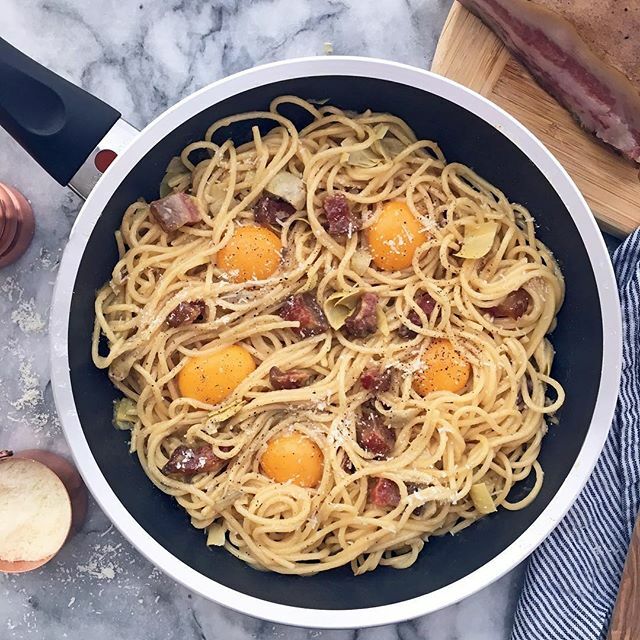 Our friends at @ballarini_usa are the leading experts and innovators in non-stick, Italian cookware that helps you bring a bit of the magic into your own kitchen. With a built-in thermopoint indicator, your pan tells you exactly when it’s ready for cooking (and cleaning), eliminating the guesswork for an effortless meal. 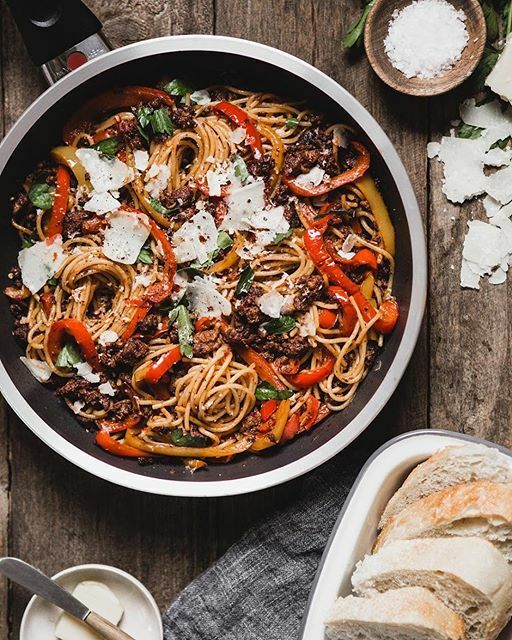 We’ve partnered with @ballarini_usa and members of the #feedfeed community to introduce you to some of the many diverse cuisines of Italy. (That’s right, it’s not all pasta and pizza!) 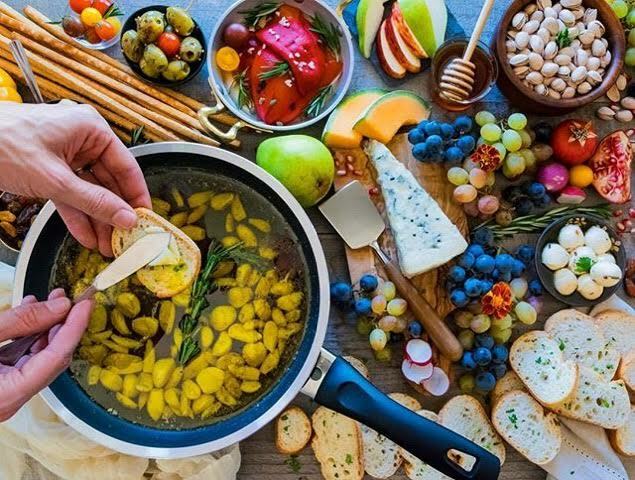 From the mountainous region of Molise, famous for olive oil desserts, to the sun-bleached coast of Sicily, famous for caponata and sardines, there’s plenty of culinary tradition to be explored. Because it wouldn’t be Italy without a hearty bowl of pasta, @kevmasse brings you this easy, flavorful dish that brings a hint of the mediterranean to your dinner table in less than twenty minutes. 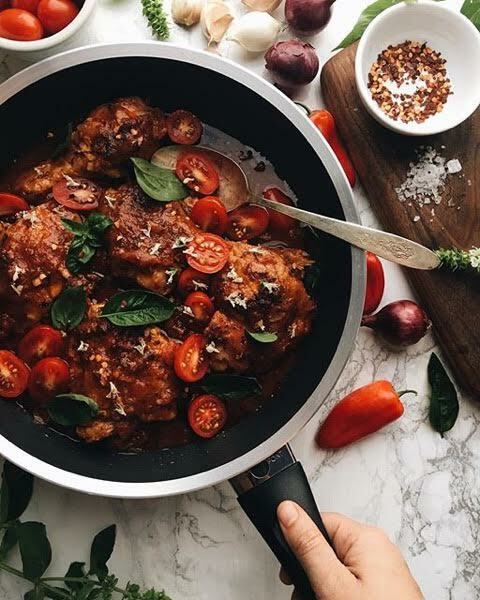 This gorgeous Pollo Alla Potenza (spicy chicken stew) was inspired by the Basilicata region in Italy, a mountainous, forested area in the south with two stunning coastlines and extensive history. Basilicata is well-known for peperoncino, a vibrant hot chili pepper that adds the perfect amount of heat to this rich stew. Risotto Alla Milanese has its roots in Lombardy, a Northwest region of Italy that houses Milan and the birthplace of Ballarini. Risotto Alla Milanese gets its warm color from saffron. @rainydaybites also adds butternut squash, sage, and brown butter for perfect fall flavor. Bagna Cauda is popular Italian dish that combines fresh garlic slowly simmered in olive oil with herbs and seasoning such as thyme. This easy, rich dish comes from Piedmont, a region that sits at the base of the Alps on the border of France and Switzerland. Piedmont is also famous for their white truffles, which attract many visitors every fall. 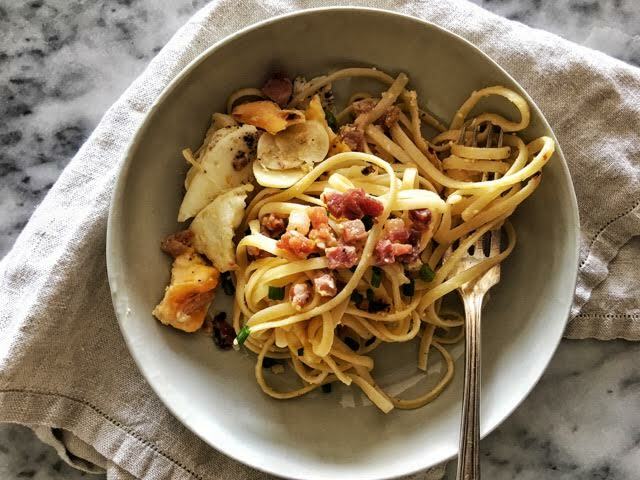 Carbonara, a pasta dish typically made with spaghetti, eggs, cheese, guanciale or pancetta and black pepper, originated in Rome, the capital city of the central Italian region of Lazio. The eggs create a creamy, rich sauce (sans cream!) for the perfect Italian comfort meal. Panzanella, an Italian salad typically made with stale bread, tomatoes, onions, basil, oil and vinegar, comes from the region of Tuscany. Tuscany, located in central Italy, is home to diverse landscapes and a rich cultural and artistic heritage. 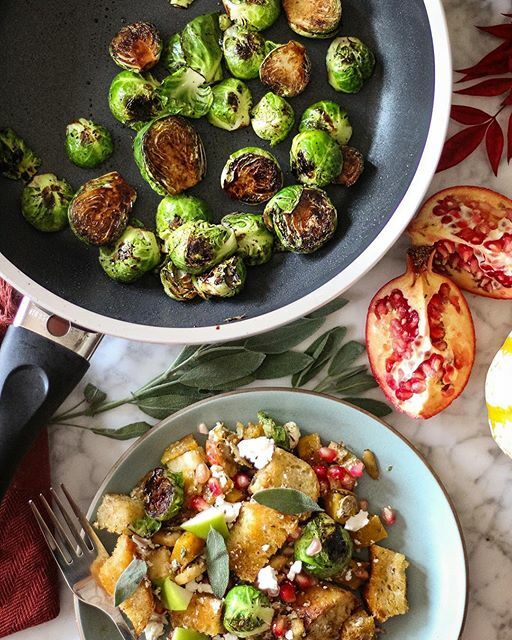 @Thejamlab's Autumn take on a classic Panzanella Salad is made with oven crusted bread, delicata squash, red and green apples, pomegranate seeds, brussels sprouts, pumpkin seeds, goat cheese, sage, and drizzed with an apple cider maple vinaigrette. This meal was inspired by the region of Liguria, a northwest region of Italy known for it's vibrant fishing villages. 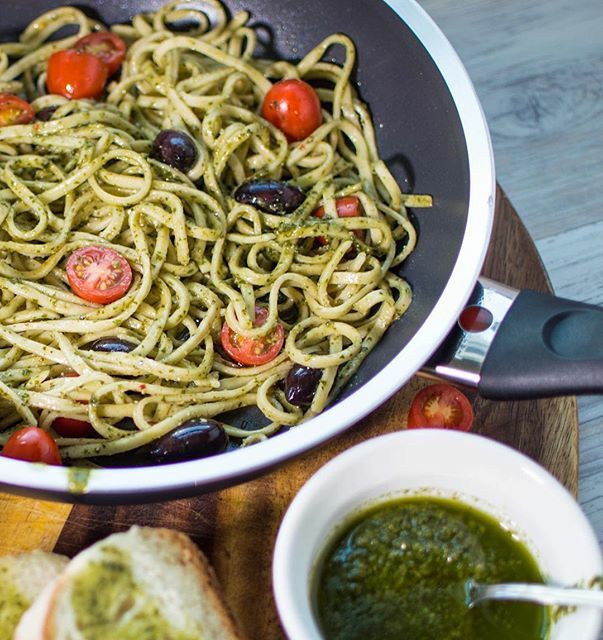 Liguria is famous for pesto; their traditional Pesto alla genovese is made with basil, pine nuts, parmigiano, pecorino, garlic, salt and olive oil. 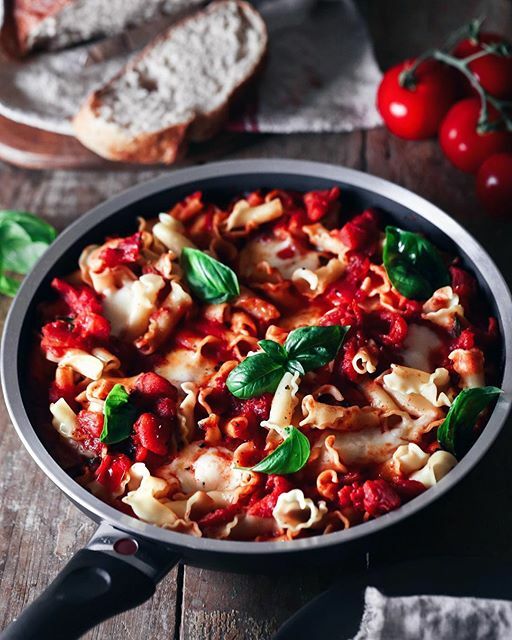 Simply combined with fresh pasta, tomatoes and olives, this Italian dish is sure to be a crowd-pleaser. 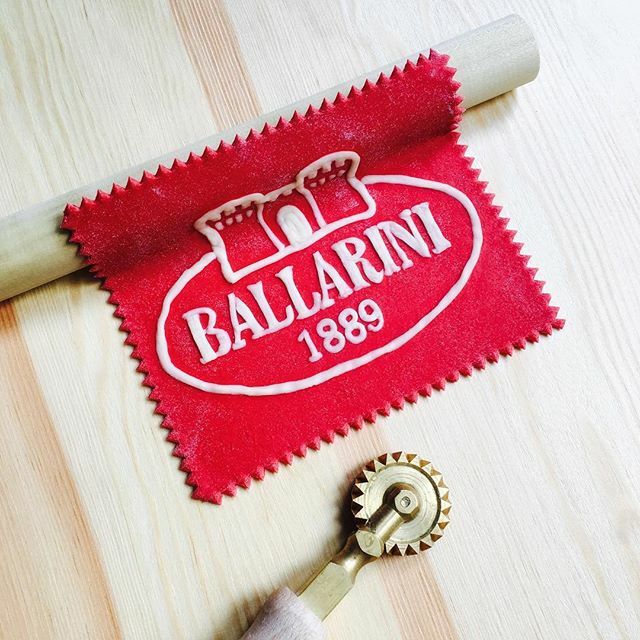 Linda of @saltyseattle designed the Ballarini logo out of pasta! She uses all natural foods to create vibrant dyes for her pasta, like peppers, paprika, beets, and tomatoes for this gorgeous red. 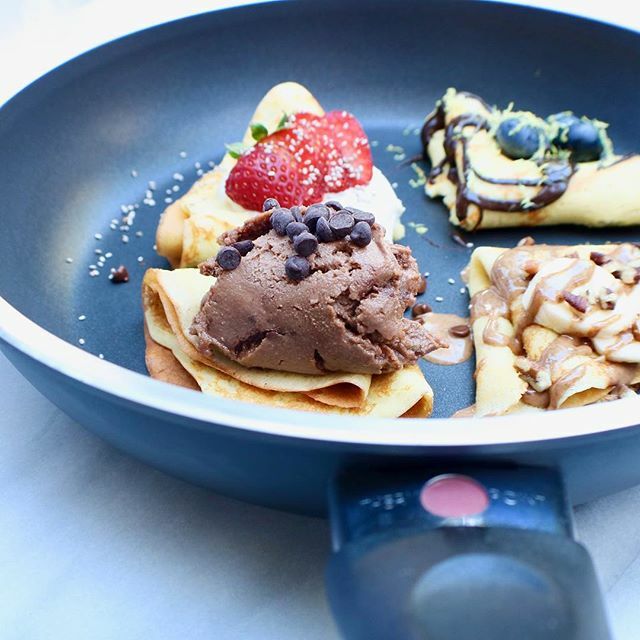 Lindsay of @thetoastedpinenut whipped up some olive oil crepes in her Ballarini pan, topped with fresh fruit and chocolate sauce. This dish was inspired by the region of Molise, a mountainous region of Italy bordering the Adriatic Sea. Molise is famous for olive oil-based desserts. Olive oil lends a deep, aromatic flavor and richness to baked goods, including these crepes. Joscelyn's dish takes a spin on the beloved Margherita Pizza, bringing the same flavors to an easy-to-make pasta dish. She was inspired by these flavors on a trip to Campania, a southwestern region of Italy home to Naples and the Amalfi Coast, where you can find some of the best Margherita Pizza in the world. 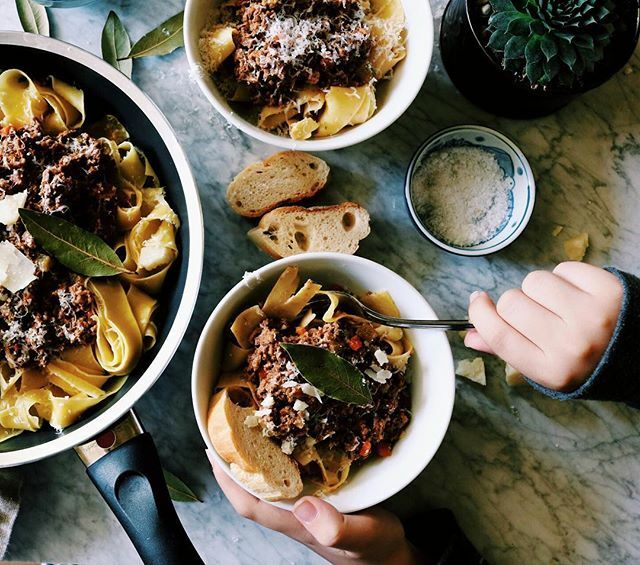 As @displacedhousewife puts it, "Stop what you're doing and make yourself a big cozy bowl of Pappardelle alla Bolognese!" This comforting dish consists of a rustic sauce over a bed of pappardelle, and finished, of course, with fresh parmesan. The inspiration for this dish comes from a northern region of Italy, Emilia Romagna, which is considered by many to be home to the best cuisine in Italy. This Spaghetti Alla Chitarra with Lamb Ragu comes from the Abruzzo region of Italy, a region east of Rome on the Adriatic coastline. Spaghetti Alla Chitarra is a variety of egg pasta; the name comes from the tool that is used to create the pasta (Chitarra translates to "guitar") by pressing down onto wires to cut into long, thin strips. Paired with a rich, meaty sauce, this is a delicious slow-cooked pasta dish. 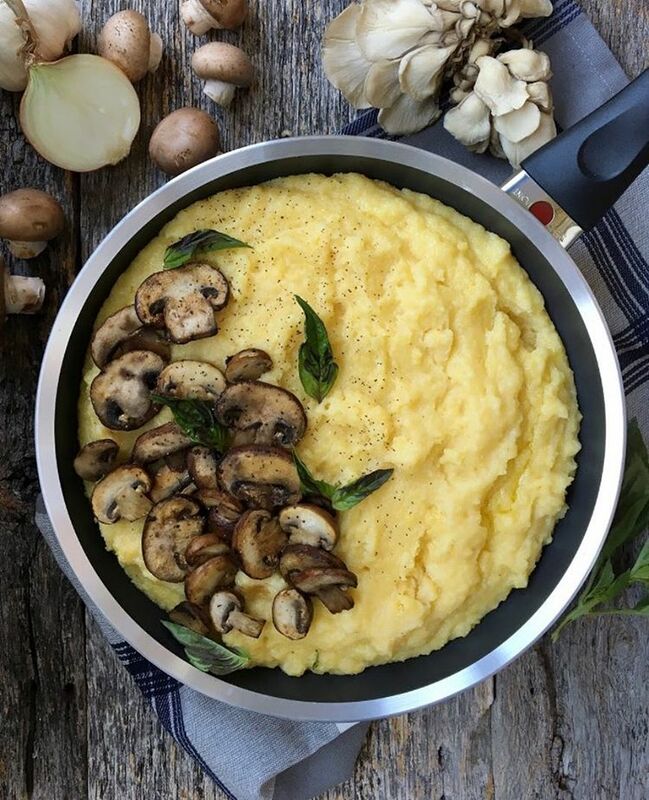 Cozy up with a warm bowl of polenta topped with pan-roasted mushrooms this weekend. This plant-based dish by Corey of @plantifulblonde comes from the region of Venice, Italy. 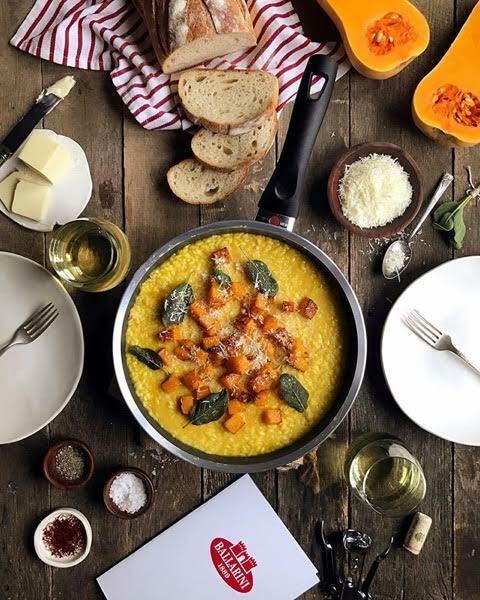 Polenta has been a Venetian staple for centuries, often in place of bread, for a hearty, filling dish that is just as delicious on its own as it is topped with mushrooms, cheese, or meat sauce. 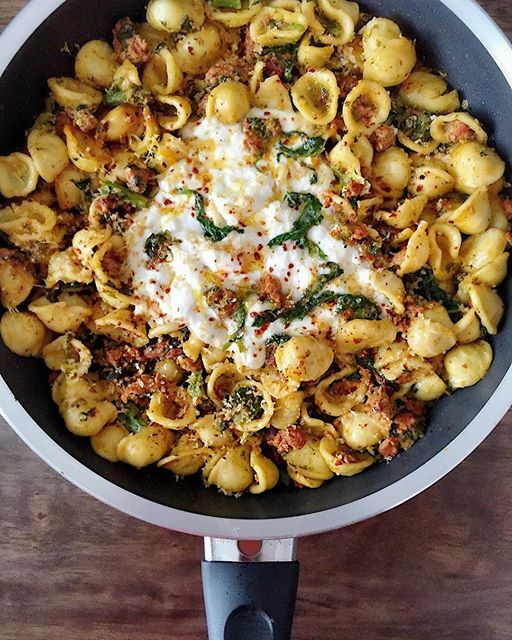 @Dad_beets is making us all hungry with his dish from the southern region of Puglia: Orecchiette with broccoli rabe, spicy pork sausage, red pepper, lemon zest, pecorino, bread crumbs, and burrata. Burrata, a mozzarella-like cheese that melts perfectly on hot pasta, also comes from Puglia.